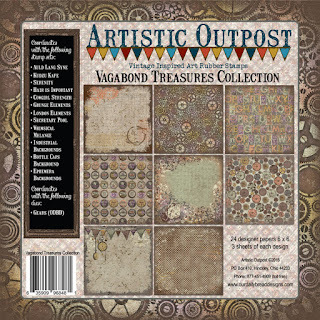 Stamping with Julie Gearinger: Artistic Outpost January 2017 New Release! 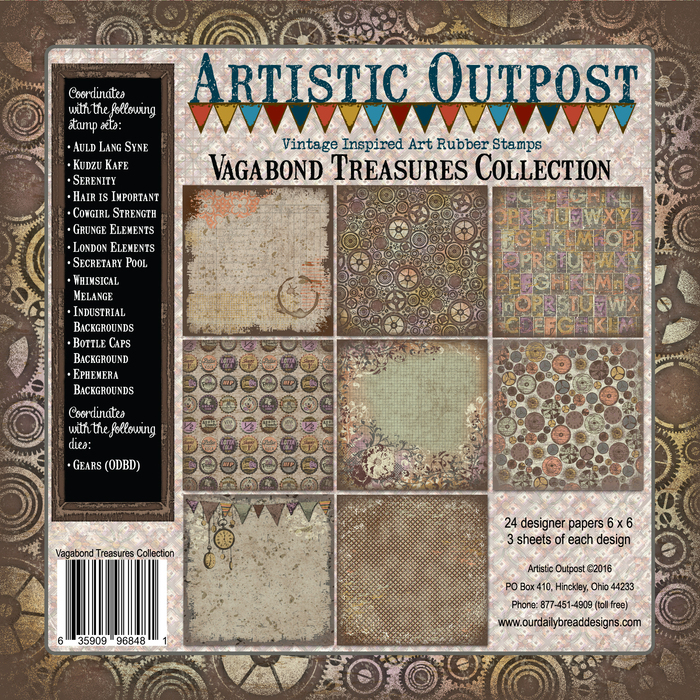 Welcome to the January 2017 Artistic Outpost New Release and Blog Hop! 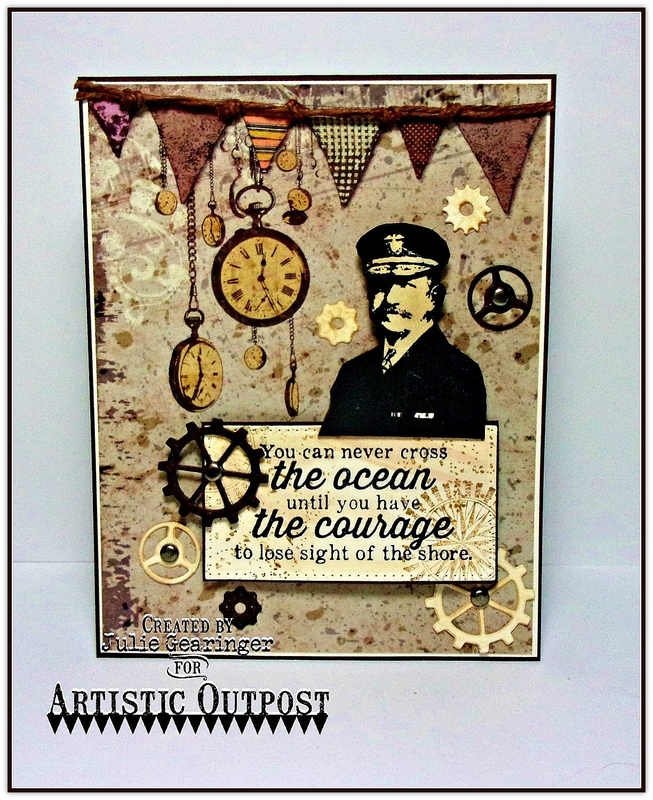 This month, Artistic Outpost is releasing the new stamp set, The Captain along with the new AO Vagabond Treasures Collection 6x6 Paper and the new AO Steampunk Gears Dies (all available from Our Daily Bread Designs). 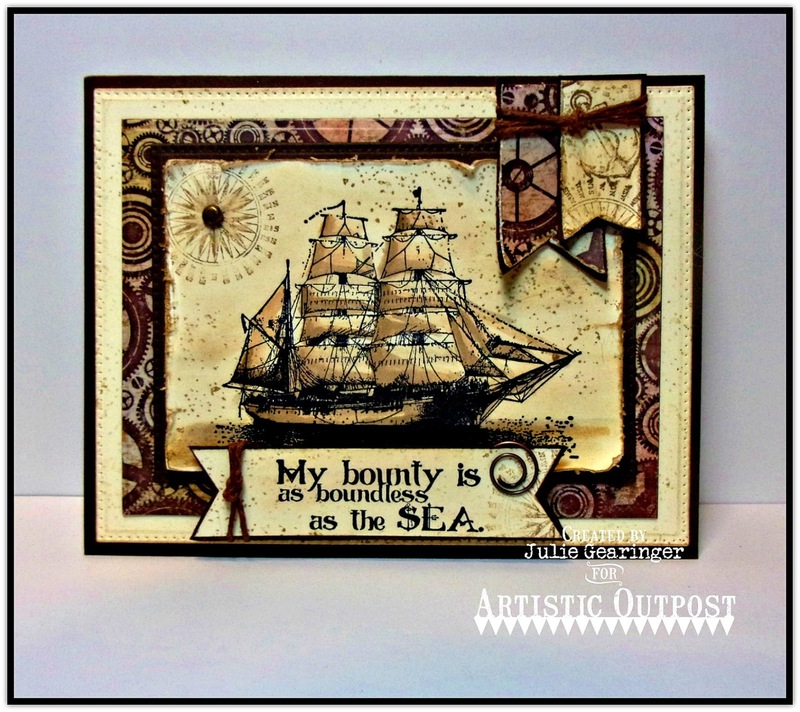 I love the vintage seafaring images in the AO The Captain stamp set plus the new AO Steampunk Gears Dies are the perfect complement as well as the fabulous new AO VagabondTreasures Collection 6x6 Paper Pad! Masculine cards are sometimes difficult to design but with this January2017 AO Release, the work is almost done for you! We would love for you to hop along with us (see details below) so I will post more detailed step by step instructions for each card at a later date. 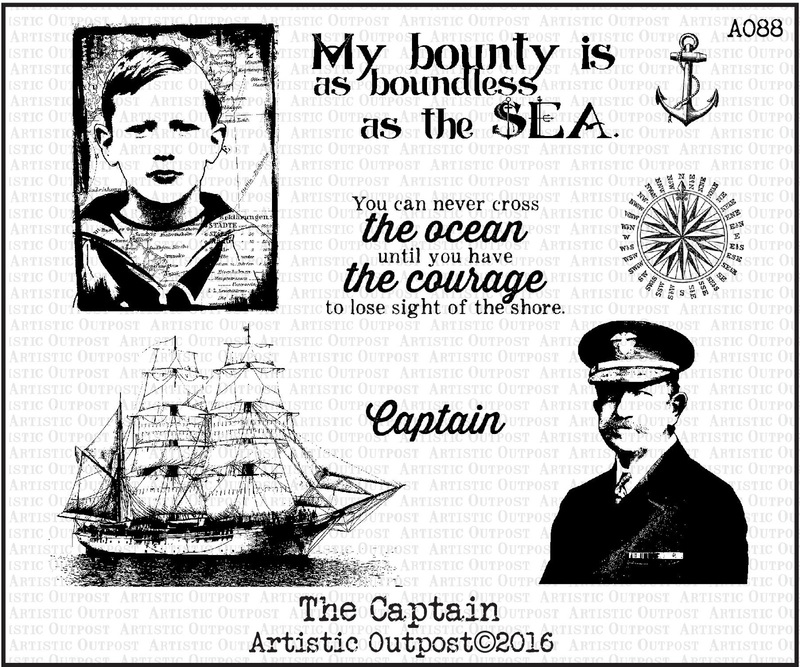 My first card features the AO The Captain stamp set, the AO Vagabond Treasures Paper Collection 6x6 Paper Pad along with the ODBD Pierced Rectangles and Rectangles Dies. 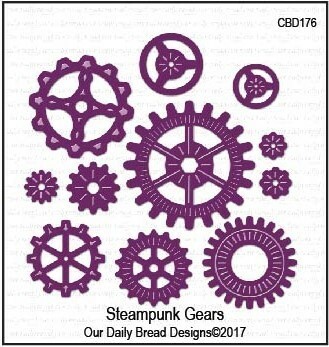 My second card again features the AO The Captain stamp set, the AO Vagabond Treasures Paper Collection 6x6Paper Pad as well as the new AO Steampunk Gears Dies along with the ODBD Pierced Rectangles Dies. Prize Information: Just for commenting on the Design Team Blog Posts, you have a chance to win a $15 Gift Certificate to the ODBD Website. You have until January 13, 2017 at 10:00 PM CDT to leave comments on the participating AO DT blogs for a chance to win! One random winner will be selected from the comments left on the designers blogs, the winner will be announced on the AO Blog on January 14, 2017, be sure to check back there to see if you have won! I am linking the first card to the Word Art Wednesday #264-#265 "Anything Goes" Challenge and the second card to the Simon Says Wednesday "New Something" Challenge. 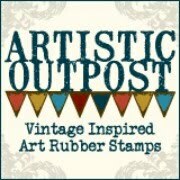 Thanks again for stopping by- I hope you have a chance to comment (and possibly win) plus I cannot wait to see what you create with the new Artistic Outpost January 2017 Release! They are fabulous cards, Julie, love your vintage and masculine designs. Excellent! I always have such trouble with masculine cards. These are awesome! Two wonderfully vintage cards, Julie! Love how you combined all the NR items! This is awesome, Julie. Thanks so much for sharing your talents with us. You're so good at doing all the cards I can't do, and I always enjoy visiting your blog. Have a blessed week. I love the colors you have used on your projects! I always have a hard time with masculine projects but both of these are great!